You get a yearly checkup at the doctor’s office and you regularly take your car in for service, but when was the last time you had your home checked out? The energy assessment is the first step you can take to understand how energy efficient your home is, how much energy it consumes and, more importantly, how it is performing overall. 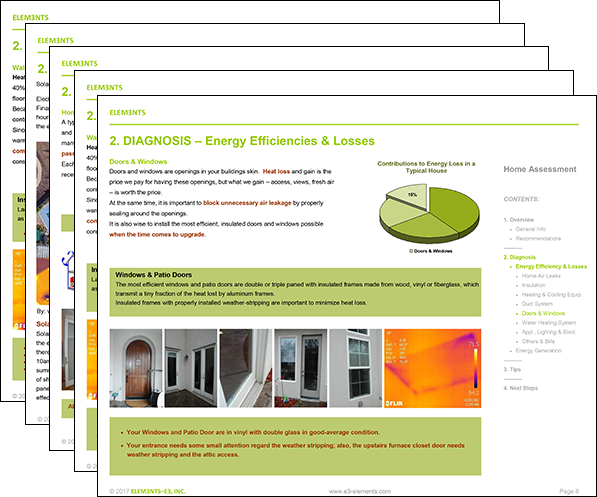 ELEMENTS will give you the most comprehensive home energy assessment available. We provide homeowners will every piece of vital information they’ll need in order to make informed decisions about how to improve their home’s energy efficiency and sustainability. When we finish our analysis on your home, we carefully consider your budget and goals to make sure you are getting a plan tailored to your needs. Furthermore, we help you find the perfect contractor to make sure our assessment recommendations are carried out quickly and correctly. In other words, ELEMENTS bridges the gap between homeowners and contractors. Throughout the entire process, we will check in detail to assess your home’s energy use. Our energy auditor will do a room-by-room examination of your home, as well as a thorough examination of your past energy bills. Assessment: Our comprehensive home inspection will take roughly 4 hours to complete. Report: Once we are done learning all we can about your home’s energy efficiency, we will complete an easy-to-understand report within 1 week. Plan: After you have received our report, we will schedule a phone call with you to answer any questions and address any concerns you may have. Together, we will finalize your goals and come up with the best plan possible.